Take My Hand Uganda - Good News. Good Gifts. Good God. Founding and establishing a non-profit organization is not for the faint of heart! How blessed I am to have a board of people who possess the combination of an astute business mind and a humble, let-God-lead heart. It was a long process with seemingly waist-high piles of paperwork and an even longer wait. But finally, approval came through just a few weeks ago! We are now officially a 501(c) (3) public charity (effective May 22, 2014) and contributions to us are deductible from Federal Taxes under section 170 of the IRS Code. 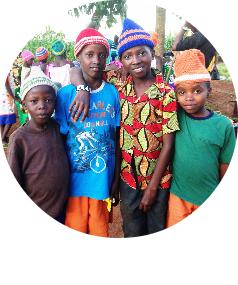 NOW is a GOOD time to give as we begin to dig in to a place where we can put hands and feet to your donations through child sponsorships, project funding and the search for land in Uganda as a permanent home for Take My Hand Uganda. Your gifts are tax-deductible and are an investment in the life of a living, breathing, needy child. 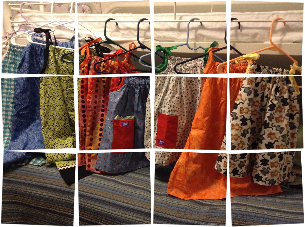 ​Eighty-six dresses from Dress a Girl Around the World ​arrived in a huge box on my doorstep a few weeks ago! These will be going with me to Uganda to give to the girls in two communities steeped in poverty that I will be visiting; Kiryandongo and Kyankwanzi. I'll also hand-pick one for each of the girls with TMHU. This was an incredible gift! Thank you Rachel Eggum Cinader! A new dress for a child living in poverty brightens the entire landscape around them with the vibrant colors and their beautiful smiles. Another gift that will go with me to Uganda are these adorable tote bags decorated by some equally adorable girls in North Carolina. They belong to a group called Girl's Talk which is all about "helping girls make good choices as they learn to be active, give back to their community, be a good problem solver and be self confident". 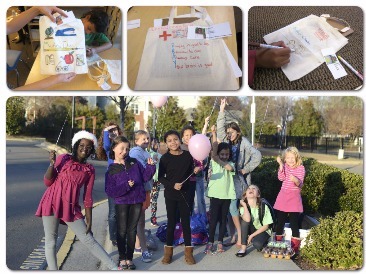 The girls personalized each bag for the twenty-nine children in our sponsorship program adding their names and a note of encouragment and friendship to go with it! Having a bag of their own, maybe to keep their letters from their sponsors in, will be meaningful and useful and they will be aware that they are being surrounded more and more by people who care and see their incredible worth and value. One of our new sponsors stepped up after hearing about the pond that these kids draw water from when they are not in school. She purchased Sawyer Point One Two Water Filter system kits that connect to a standard 5-gallon bucket and are distributed right in Uganda. 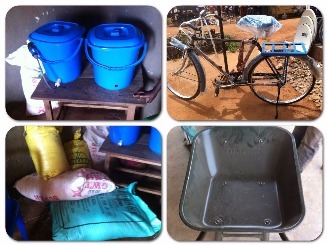 A new bike and wheelbarrows will help them get the water they collect at the pond back to the compound. It's a bit of a hike! And a sponsor who has been with us from the very beginning purchased yet another month's supply of food to supplement their diet. This gift has literally been life saving as the conditions and situation in Kyankwanzi has been dire. 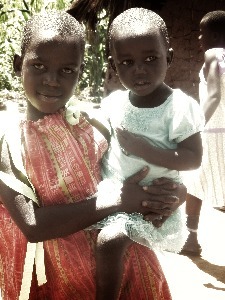 ​​I'm just in awe, really, at how much God loves these children and makes a way for them when there seems to be none! We (you and I) are His hands and feet, but He's the One who stirs our hearts and calls individuals towards compassion and a generous heart. 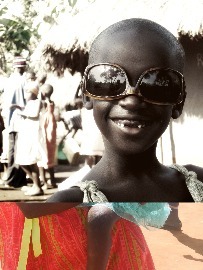 I will be leaving for Uganda the middle of May and will be spending the majority of my time there with the TMHU kids. I am over-the-top-excited to be going back and I'm especially looking forward to introducing them to their new sponsors and seeing their faces when they see their very own bed with new sheets and a blanket plus school supplies, toiletries and eveything else that will be provided through your giving and love! You have to understand how few possesions they have and how crowded their current sleeping conditions are to know the joy they will feel and the smiles that will be on their faces. I'm priviledged and honored to be able to be there in person for this new beginning in their lives. We will have a lot of shopping to do when I get there and I hope I can make up every single one of their beds before they arrive. In my mind I see myself arranging all of their new belongings on their bed along with their personalized bags filled with the things you have provided for them. I have to rememeber it is Uganda and so my plans may not happen as I think they will, but I'm having fun dreaming it up! A reminder to all the sponsors! Please get your first letter to your child to me by May 10th! Use an envelope no larger than a 5x7 and include a letter introducing yourself and your family or pets or anything else you might want to share. Please DO include at least one photo so they can see who you are. They love photos as much as we do! You can also include other lightweight items. We had a few weeks worth of trouble with our mailbox for TMHU and some people had mail returned to them. The issue is now fixed! Apologies to those of you who have to re-send something. We are still looking for God to send in three more peolpe willing to sponsor one of the three children left on our "I Choose You" page. All of them are boys! Mushaija Charles, Agaba Habert and Kayumba Charles. I certainly can't arrive in Uganda and have three of the kids waiting and wondering who will choose them. Our project fund has come a long way from $2,700 down to $410! So many people have given so that we can see that the kids have everything they need for school. If twenty more people give twenty dollars each, we will be done! Please share this email with your friends and family and encourage them to get on board!